This article contains all you need to know about flights to Azores: where to fly, the major airports, flight connections and the airfare deals to look out for. 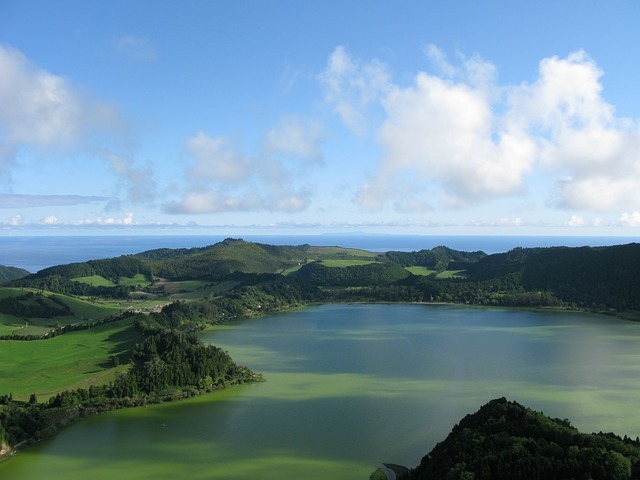 Unless you are willing to embark on a Survivor-style journey by boat, the best way to reach the Azores is by air. There are several routes from mainland Portugal, Europe and especially from United States and Canada to cater to both the ever-increasing tourists and the large azorean communities living there. The information in this page is updated until January 2019. Every island in Azores has a commercial airport. However, only a few airports have flights connections to mainland Portugal; and from those, only 2 are currently operating direct international flights. The strongest hub is Ponta Delgada airport, in Azores’ largest island: São Miguel. Don’t expect great transportation possibilities. In most airports in Azores, you’ll be limited to taxis or private transfers organized by hotels or tourism agencies. The best way to get to the center when you land is to rent a car and start exploring the island right away. Find below the airlines with regular connections to Azores. Note that during summertime, many other companies operate charter flights to and from Azores. The only airlines flying directly to Azores from United States are Azores Airlines and Delta Airlines. You can fly directly via Boston, Oakland, Providence and New York City. These routes target not only tourists, but also the strong azorean community living in these countries. There is a huge azorean community living in Canada too, but for now the only airline flying directly to Azores from Canada is Azores Airlines. The airline connects Ponta Delgada (PDL) to Toronto and Montreal. You can fly directly to Azores from several destinations in Europe in an increasing number of airlines. The vast majority of international flight connections to Azores are made from Ponta Delgada airport, in São Miguel. The remaining islands are still decently connected to each other and have frequent connections to mainland Portugal. São Miguel (PDL): apart from flights to almost all islands in Azores, has got several daily connections to Porto and Lisbon, as well as international flights to the United States, Spain, Cape Verde, Canada, Germany, United Kingdom, amongst others. Terceira (TER): daily connections to Porto and Lisbon, as well as international flights to the United States, Canada and The Netherlands. Pico (PIX): direct flights to Terceira, São Miguel and Lisbon. Faial (HOR): direct flights to Flores, Corvo, Terceira, São Miguel and Lisbon. São Jorge (SJZ): direct flights to Terceira and São Miguel. Flores (FLW): direct flights to Corvo, Terceira, Faial and São Miguel. Graciosa (GRW) – direct flights to Terceira. Santa Maria (SMA) – direct flights to São Miguel. Corvo (CVU) – direct flights to Flores and Faial. If you are looking to do a bit of island-hopping, you can connect with SATA Air Açores, the regional carrier which has flights to all the other islands. The schedules vary throughout the year and are increased in summertime due to the influx of visitors. These inter-island flights are usually short – 1 hour and 15 minutes maximum – but unfortunately can be quite costly. Another option is taking the Atlântico Line ferry boat, check my guide on how to get around in Azores. Check if you are eligible to get FREE flights in Azores! SATA Air Açores provides a FREE routing service for passengers traveling to or from Mainland Portugal or Funchal. This means that if you are flying to Azores from a portuguese airport – Porto, Lisbon, Faro or Madeira – you can request a free connecting flight to any other azorean island. This is subject to seat availability and demands that you stay a maximum of 24 hours in the island you’re flying to/from home. More information and details here. I usually don’t use travel agencies to book holidays. 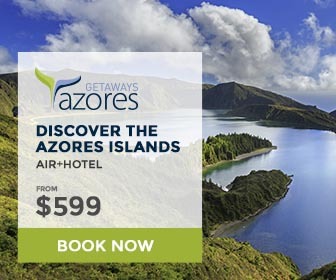 I have to make an exception for Azores Getaways because I really think they have some pretty good prices on flight + hotel Azores packages. These are particularly advantageous if you are flying from the United States and don’t have much time to plan your holidays. They offer deals from many cities like Chicago and Boston, flying mainly to Terceira and São Miguel islands. But a great thing is that you can customize your packages by adding one or two islands to your itinerary. Give them a try!